Thoughts: We are three weeks from the halfway point... wait, what?! I am anxious to feel movement but haven't felt anything yet! My belly is growing and we love it! Baby: Baby is the size of a turnip, measuring 5 inches long and weighing 5 ounces. Baby is practicing sucking and swallowing and starting to pack on more body fat! Weight: I have an appointment tomorrow so I will weigh myself then. I was up 5 at last week's appointment, and my guess is I have gained another pound or so. Symptoms: Round ligament pain can be rough at times, but that's really the only symptom I have been experiencing. Sleep: Sleeping 8-10 hours a night and loving it! I have finally gotten used to sleeping on my side, so that's a plus! Cravings/Aversions/Eating: I am still eating PB&Js like it's my job. Cereal is for breakfast every single morning and I wouldn't have it any other way. One thing I have noticed is I usually don't want meat for dinner. I still eat it, but I really just want to eat the side dishes. Workouts: I am benched for the time being. At my 16 week appointment last week, the doctor discovered a 1 cm sub-chorionic bleed. The good news is it hasn't affected the baby, and many times they go away on their own, so my doctor took away all exercise until my 20 week appointment to see if it will go away. No working out for me, but hopefully the bleed will resolve on its own and all will be good! I really prefer to be active, but the doctor knows best so I am fully following her discretion. Clothes: The rubber band trick still works most of the time for pants and tops are fitting just fine as well. However, we had a wedding in to attend and I was in a panic because none of my winter dresses would zip! I had exactly two that fit, and I wore one to the rehearsal dinner and one to the wedding. Random: We had a doctor's appt last week and got to hear that wonderful heartbeat again! It was going strong at 140 bpm. We also had an ultrasound and were just mesmerized by how active our little one was. Baby couldn't stop moving around and looked like a real baby! We have stared at those ultrasound pictures every day since. 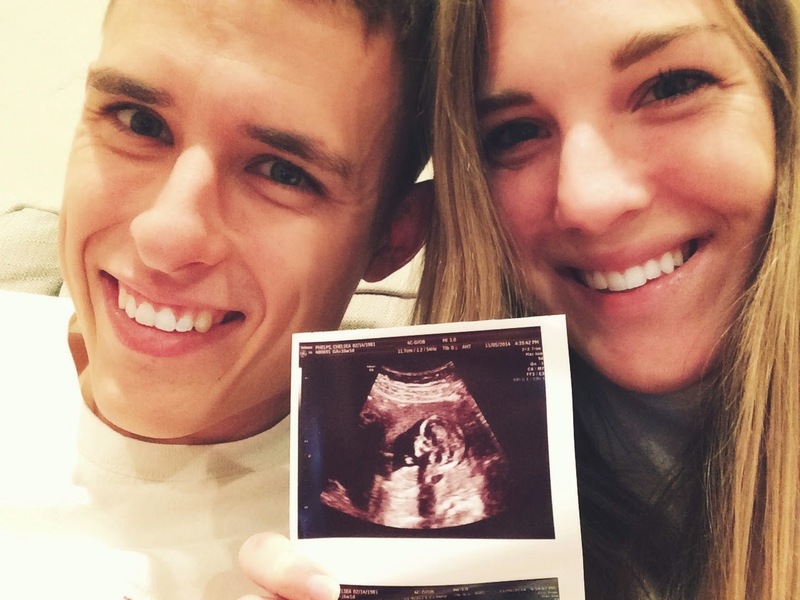 Call us crazy, but we think this baby has Parker's profile! The baby was measuring a little small so we go back tomorrow to make sure our dating is correct. Glad to hear you're still feeling well! Hope that bleed goes away soon! Go easy on yourself and remember - walking is JUST as good for you and baby. I can't run either, and it definitely makes life hard on me, but we do what we have to do! So exciting!!! I really hope the bleed fixes itself. If it doesn't what does that mean or what happens? (Sorry, this is all new stuff to me!). I hope you're able to get back to working out soon! I hope all is well with the bleed. I can't imagine how happy y'all were to hear the heartbeat and see your little one moving around. Praying that the bleeding resolves itself!! You and Baby Phelps are in our prayers. Such a nice update! 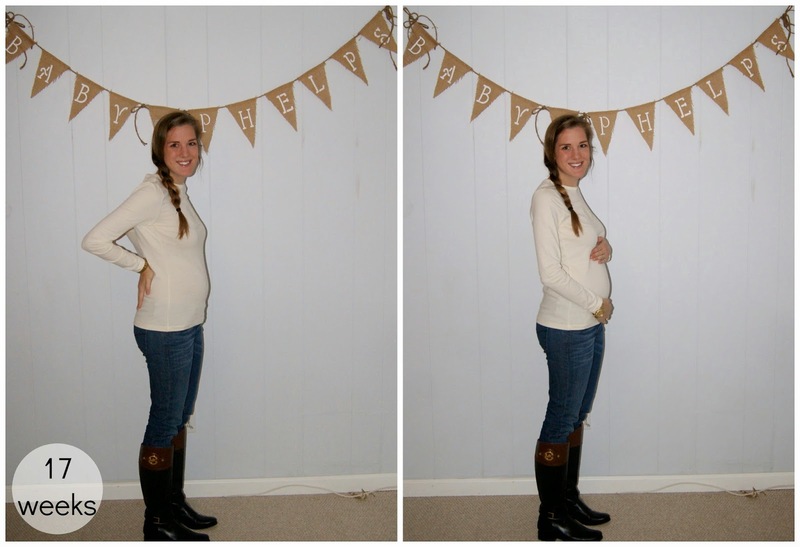 Hope all goes well at your 20 week appointment! Your bump is starting to grow and it is so cute! Sorry to hear about the bleed, hopefully it goes away soon!